National HRS has produced some excellent educational materials in the form of posters which can be printed out and distributed. 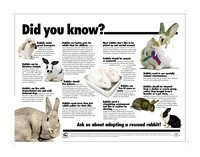 Click on the poster for a full size version. 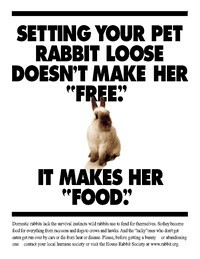 Discusses the consequences of setting a pet rabbit loose instead of taking to an animal shelter. 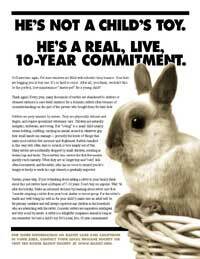 Emphasizes that pet rabbits cannot survive in the wild. 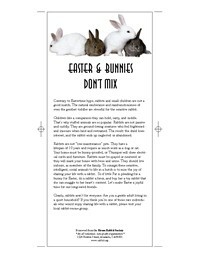 Cautions about the reality of getting a rabbit for Easter as an impulse purchase. 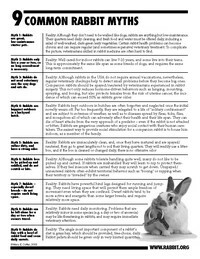 A good primer on the attributes of rabbits as housepets. An attractive, eye-catching piece for display in shlters. Recaps the differences about the expectations of a fantasy stuffed animal and a live animal that needs daily care & has a mind of its own. 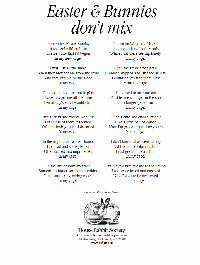 A touching poem about the life of an Easter gift.